Welcome to your Subject Guide for Film Studies. It offers some basic guidance on how to find and use the Library's resources in this subject area. The library holds over 11,237 DVDs and Blu-Rays. These are primarily selected to support the Department of Film Studies and include films and holdings of extremely rare reference materials such as ethnographic films and documentaries by filmmakers like Frederick Wiseman and Jean Rouch. Find out which DVDs we've purchased recently in the box to the right. Search the library collections to find which DVDs and Blu-Rays are available. Enter a title, keyword or director into the search box. If you get a lot of results then you can refine the search by selecting Audiovisual from the Format option on the left-hand side of the screen. You might also find it useful to refine your search by the Genre option. This would allow you to find specific types of film, for example silent films, adaptations, animation. The Moving Image Archive is Scotland's national collection of moving image held at the National Library of Scotland, the catalogue provides access to over 2,000 clips and full-length films. It was designed to promote British values, manufacturing and the ethos of the Commonwealth to audiences. Screen Studies Collection is the main specialist database for Film Studies. A survey of current publications relating to film scholarship alongside filmographies. The database contains three different indexes: American Film Institute (AFI) Catalog; FIAF International Index to Film Periodicals; and the British Film Institute's Film Index International. The indexes can be searched in one go or individually by using the links below. covers history of American cinema from 1893 to 1975 with full or short records from 1976 onwards. Available via Screen Studies database. - in the Institution search box beneath "Connect through your Library or Institution" enter "University of St Andrews" and click "Find"
contains FIAF’s Treasures from Film Archives, a selection of reference volumes, article abstracts and some full-text journals that reflect film holdings from archives around the world. Available via Screen Studies database. from British Film Institute this resource indexes films from over 170 countries and can be searched both by film but also by person. Available via Screen Studies database. full text for 120 journals and 100 books, plus indexing for 380+ publications in film and television theory, screenwriting, production, cinematography, reviews. developed as the medium for reproducing broadcasts, The Listener (1929-1991) was the weekly newspaper published by the BBC. Provides an insight into the intellectual and cultural history of the twentieth century, and also to the golden years of radio and television. 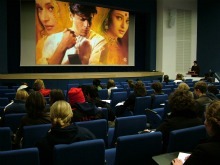 Frames is run by the postgraduate community within the Film Studies Department at the University of St Andrews. Autumn issues publish new work from members of the British Association of Film, Television and Screen Studies (BAFTSS). Spring Issues focus on emerging themes within the discipline.